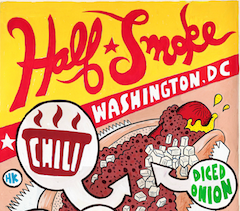 My good friend Craig pointed out Serious Eats’ article on the Beloved Half Smoke, which includes a fine history of this excellent regional delicacy. True fact: for the first year I lived in DC, I couldn’t believe that the street hotdog carts sold half-packs of cigarettes. I had no idea just how clueless & stupid when a friend of mine introduced me to the real deal. Craig was also quick to point out that you can even get half smokes shipped anywhere in the US via the ever-awesome Ben’s Chili Bowl. Please note that this is the same Craig who runs a wonderful (if sporadically updated mp3 blog at 5dots.tumblr.com. And if it’s any consolation, Tom, I grew up around DC and only got around to having a half-smoke when I was 24, and even then mostly because I needed to try one before I moved away. Probably a mistake, though: now I know what I’m missing.